An LED light on the domino to make it easier to read layout lines on the work and line them up with the domino's cursor would be OUTSTANDING. Just glue this little guy on it. Where do you get em? I got mine at the Lego shop. I agree it would be dandy if Festool came out with a Domino light. I was working on something as it was getting dark recently, and I McGyvered this together. I just wrapped the elastic headband around the t-handle. The light is very compact and plenty bright. It also rotates up and down to put the light where it's needed. Unfortunately, it looks like Surefire has stopped making this headlamp, called Minimus, and they are kind of expensive. The only one they have now is much larger and even more expensive. The thing about lighting the Domino is to use a light with even, hotspot-free illumination. 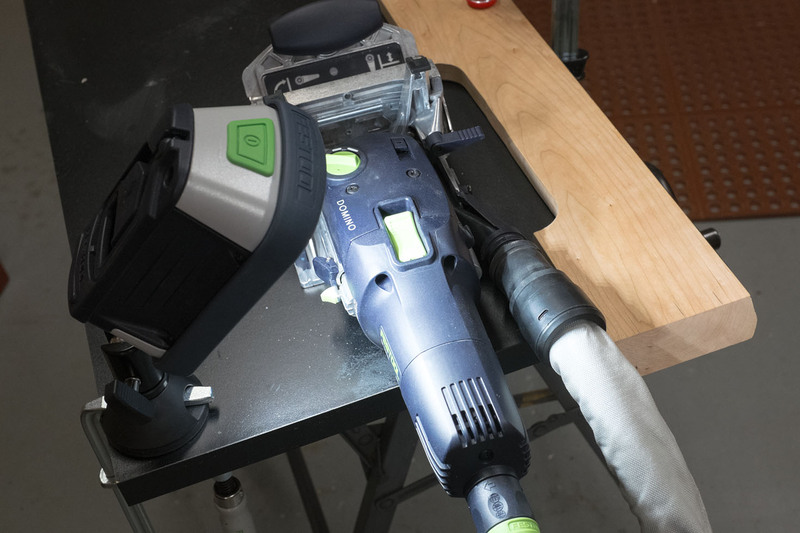 Festool could easily fix the lack of light on their tools simply by offering a small stick-on LED light that uses one of the common small flat, round batteries. Should be Festool green. It could be retroactively used on routers, drills, Dominos, Vecturo, etc...Of course, I would expect it to be offered at a small cost, not the usual over priced Festool branded price. Yeah. I doubt it would be cheap though. If they thought it out like they do most of their products, it would probably be worth it. I've have the Syslite for just a few weeks and I am finding it extremely useful to help with older eyes! The magnetic base is fantastic...I use it along with a Syslite outside when I'm grilling, just stick it to the Weber frame. Wow, great ideas. I never even thought to use it for a tool, machine, grill, etc light. It's small enough to use for painting when cutting in. I can hold it with one hand. Here's how I resolved my lighting issue when I'm working in the shop. $20 at Lowe's. Beats moving an old desk lamp around and clips to the workbench and portable stands I have set up for my bandsaw and spindle sander. And I did use it the other night when using the Domino. There are various clip on reading lights that will work. This one is the Energizer LED Clip On Light at $7.00. It easily clips upside-on and downside on when using the Domiplate. It easily lights up the infernal faint line although I usually hit the line with a Sharpie wiping off the excess. I wish they would etch this line deeper. I bet @mirock is working on an onboard light system for the domino as we speak. I can't do photos, so words will have to do. I bought 3 anglepoise lamps quite cheap. They have a large weighted plastic base, suitable for desk use. The arm of the anglepoise has a stub that just sockets into the base, allowing it to turn. Great for desk use, lousy for the workshop. I cut some blocks of 2x2, bored a (14mm) hole through the top to fit the lamp spigot. Screw the block to the wall anywhere you want to place a lamp. I've got one block screwed to one pillar drill. The other pillar drill I found a piece of steel tube the correct bore. 4" length of tube, hammered flat leaving 1 1/2 " piece of tube untouched. Drill 2 holes in the flattened part and rivet it to the pulley housing. I wish I'd thought of the steel tube approach earlier.... a neater solution. I've picked these lamps up for £4 ish in sales, and they get thrown out by people who realise they aren't students anymore and so need something more expensive. Now, even my little dewalt trim router has an LED and I love it. It makes seeing your work so much easier better and faster. All of that leads to better results. I saw a great video where an LED was installed on a 1010 router. Genius, but voids warranty I'm sure. Does anyone know if Festool has a good pulse on these forums? 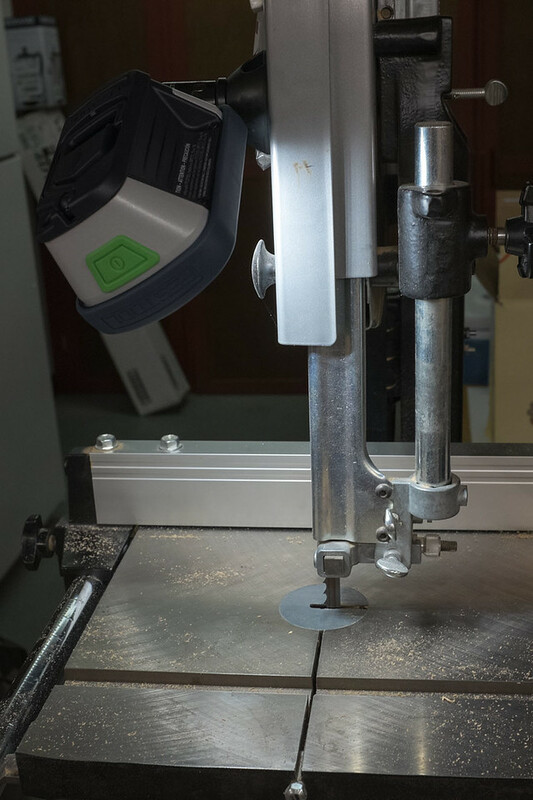 Festool is always on the forefront of innovation. In todays high tech LED world, LEDs are a no brainer in my humble opinion and it seems the FOG has a lot of support for it as well. I think this is just a gap on some of their tools. Yea EVERY power tool should have an LED light on it. It really is a shame that so many Festool tools do not. That is something they should have been innovative enough to have figured out how to include in all their designs. Like saying every car should have a radio? One headlamp services all the tools, and the light moves with my vision. If you need light, where you are looking and you are moving, take a headlamp. ...but I also added the sys light and magnetic base to my shopping list.